Last weekend, I decided that the week ahead was looking tricky. I did my weekly grocery shopping towards the beginning of the weekend, to allow myself time to prepare multiple meals that would serve as dinners and lunches for the whole week. It also just so happened that my latest issue of Food Network Magazine had just arrived, and as usual, I had torn out some recipes I wanted to try. Over the course of two days I made 5 different meals, half of which I put in containers and froze for later on in the week. 2 of these were inspired by recipes I cut out of the magazine. Batch cooking (as long as you are actually consuming your leftovers, not throwing a lot of them away), is both a money saver and a time saver during the week. If you are like me, you have a well stocked pantry. This also helps cut your grocery spending down. I ended up only needing to purchase the meat, special cheese and fresh veggies. My menu for the week included Chicken and Spanish Rice, Crock Pot Pork Roast and Beans, French Onion Soup,Spicy Penne with Swiss Chard, and Buffalo Chicken Salad. 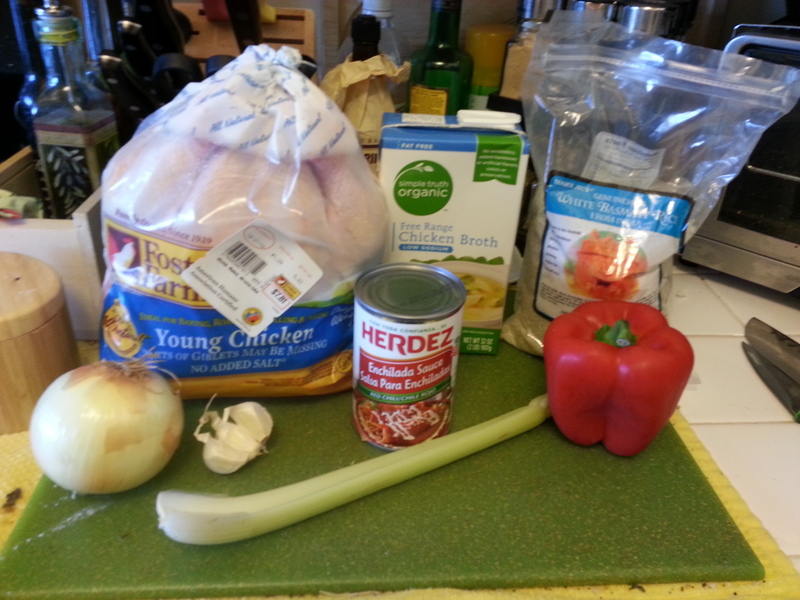 I will post the recipes for all of these over the week, but today I am just doing the Chicken and Spanish Rice. Before I get started I have to apologize. Most of these recipes do not have photos of the finished product, just during the cooking process. Also, Some of the pictures are not the greatest quality. When you are juggling taking care of an infant, a husband, and cooking multiple things at the same time, compromises have to be made. This chicken and rice meal has been slightly adapted from something my dad used to make for dinner all the time when I was young. Smelling this as it was cooking reminded so much of home. I love when I get to share that part of my childhood with people. For my dad, food has always been his way of showing affection, so recreating his recipes and sharing them with my friends and family is definitely a feel good affair. Here is what you will need. Cut up your chicken. I cut my chick up into 8 pieces, and then cut the breasts in half because they were really large. In a large stock pot, Brown the chicken on both sides over medium high heat. This should take about 2 minutes per side. Take the chicken out of the pot, lower the heat just a little, and add in your diced onion, diced pepper, and diced celery. After the veggies start to release some liquid, give them a stir and scrape the bottom of the pot to get up all the yummy brown flavor bits from browning the chicken. When the onions are translucent, add the Garlic, Cumin, Chili Powder, and Oregano, and let cook for a minute, or until the garlic is fragrant in the pot. 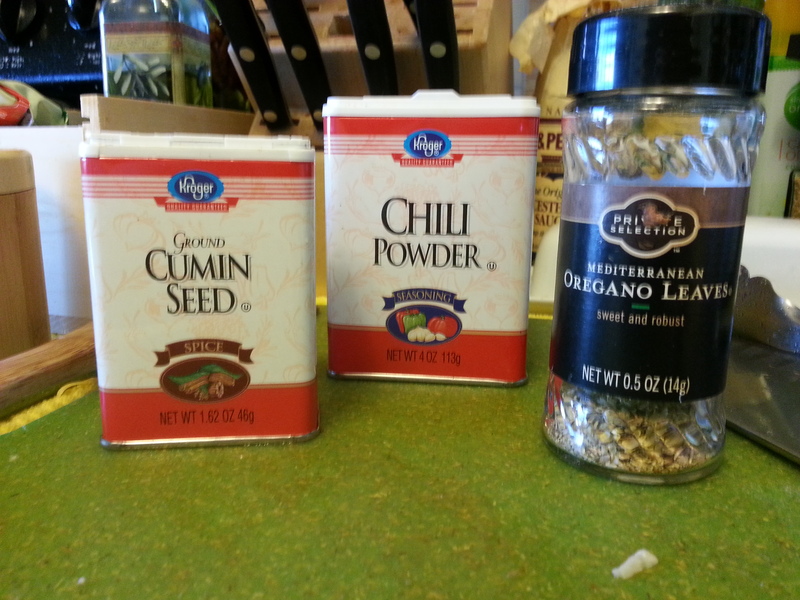 We add the herbs and spices here to let them toast a little with the veggies to help bring out their oils and flavor. Add the rice and stir. Let the rice toast a little until it too starts to turn translucent, then you can add the liquids. Letting the rice toast a little adds a nice nutty flavor to the dish. Remember rice usually cooks at a two to one ration. Two parts liquid to one part Rice is the standard. 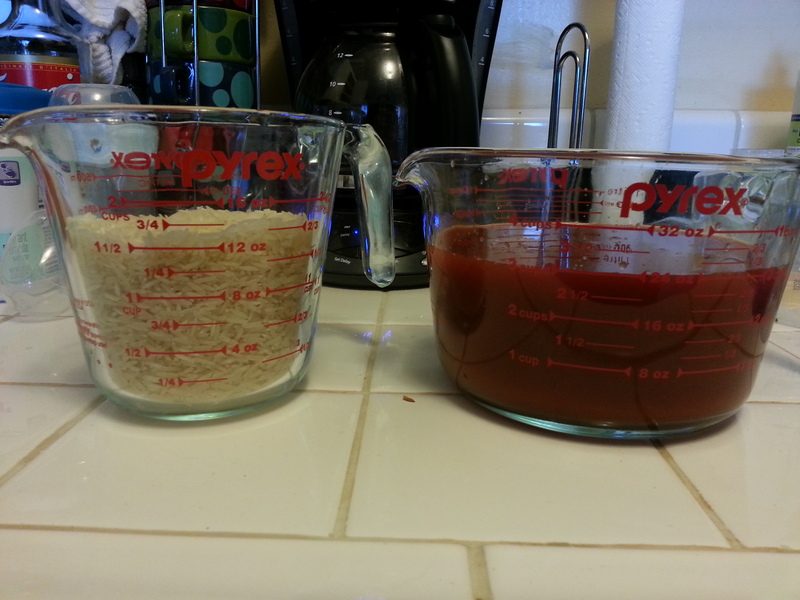 In this instance, I am including the Enchilada sauce in my liquid measurements. After you pour in the liquids, give everything a good stir, making sure to scrape the bottom still. We want all that flavor to come up! 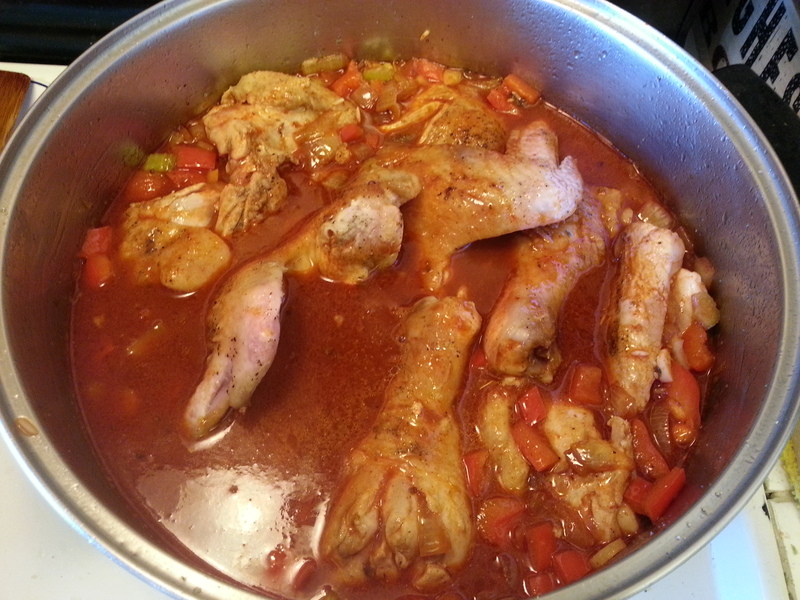 Nestle your chicken pieces back into the pot and bring it up to a boil. Turn your heat down to a simmer and cover until the liquid is gone, your rice is tender, and the chicken is cooked through. This usually take about 12-15 minutes. This is comfort cooking in one pot. It is one of my all time favorites. If you want to jazz it up a little more, you can serve it with a shave of cheddar cheese over the top and some green onions. Remember, this is 8 (or 10) pieces of chicken, so it serves 6. That is a lot of food for two people! Needless to say, we ate this throughout the week. 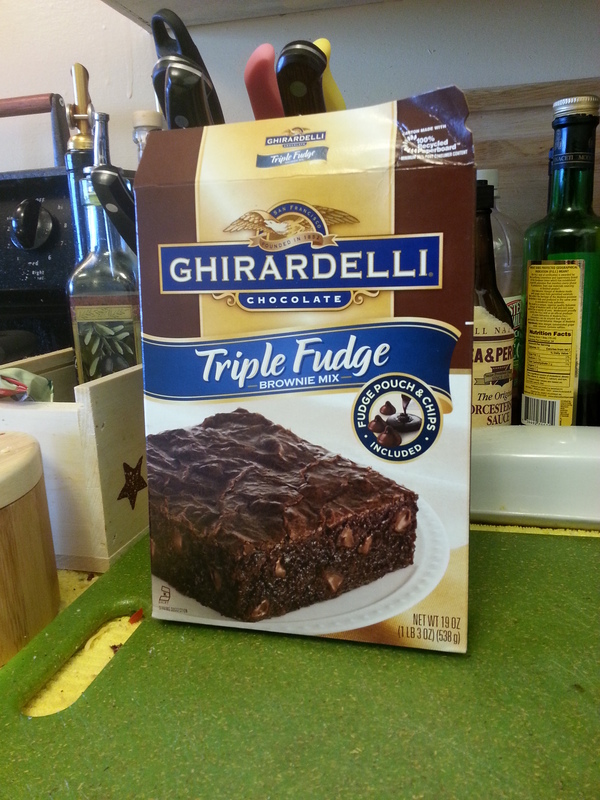 Oh I forgot,I also made some brownies from the box, because you cant have all this tasty savory food with out some dessert! Stay tuned for Crock Pot Pork Roast and Beans!